Hello, hello, whoever you are, whoever you are today. I'm in quite the silly mood but don't have much to say. There's a new column out if you'd like to know. when silliness is the mood. Vinaigrette ● Whisk all ingredients in a small bowl. 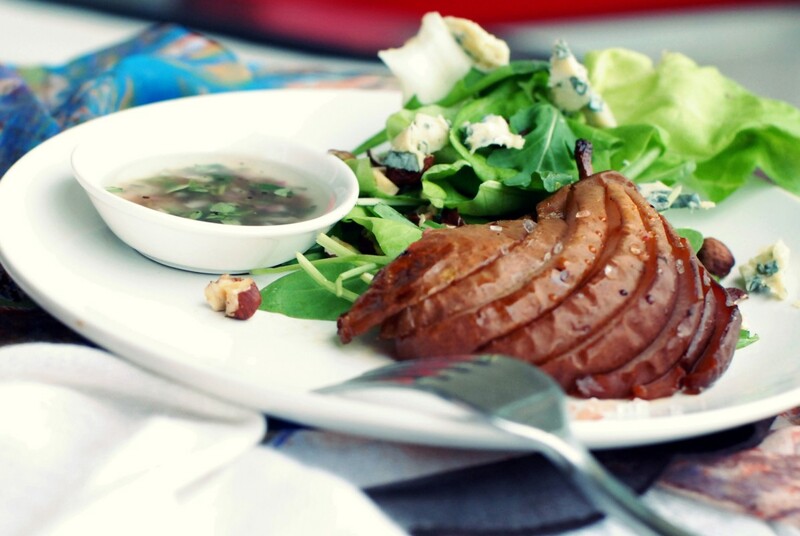 Pears and salad ● Preheat oven to 175 degrees Celsius. ● Place thyme sprigs on a baking sheet or parchment paper. ● Place your pear halves, cut side down, on a chopping board. Starting 1.5 centimeters from each stem, cut lengthwise into 1 centimeter slices. Apply pressure gently to fan out the slices. ● Place pears directly on the thyme. Drizzle the pears with honey then sprinkle with salt and pepper. Bake until pears are tender, about 15 minutes. Turn your oven off and allow them to rest in place for half an hour before serving. ● Combine lettuce, rocket in a large bowl. Add prepared vinaigrette and toss to coat. You could also opt to serve the vinaigrette separately. Divide salad into separate portions. Place the pear halves alongside your salad. Garnish your salad with blue cheese and top with hazelnuts.